There aren’t that many opportunities in the year to have a large meal and just go all out. For Americans, there is Thanksgiving, which is held on the last Thursday of November each year. Relatives from far and wide typically come to visit so they can enjoy the annual dinner with the ones they love. There is also a parade filled with giant balloons of cartoon characters many of us know and love, followed by a football game. Once the dinner concludes, dessert of pumpkin or apple pie is served. The UK is an entirely different story, however. Each Sunday (yes, every Sunday), many Britons make a dinner consisting of meat (usually beef, pork, chicken, or lamb) that is roasted, potatoes, which are also usually roasted, vegetables, stuffing, Yorkshire puddings, and who can forget, the gravy? The history of a Sunday Roast (or Sunday Dinner) started very simply: many people did not eat meat on Fridays since they were following their religion so it was usually eaten after church when families would whip up a nice Sunday dinner. This has been a tradition since around the 1700s and is a very hearty one, still going strong today. People always make sure they’re home for Sunday dinner! 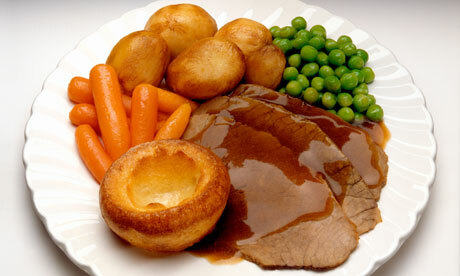 If you have never made a Sunday Roast, what goes in one? Of course, the standard roast but it’s your choice of what kind of roast. Fancy beef or chicken? Roast it! And the most popular vegetables used to help make up the Sunday Roast range from carrots, to broccoli, to even parsnips. Potatoes are sometimes boiled but are most commonly roasted to be perfectly crispy. Then there’s the stuffing. Now, this isn’t the Thanksgiving stuffing you’re used to. This is stuffing rolled into balls but sometimes it is also made into a dish like traditional American stuffing. There’s also the Yorkshire puddings, which are baked in a special pan (or in a muffin pan) with hot oil until they just pop up! Don’t forget the gravy! Just describing this makes me hungry! Now I can see why everyone goes home for Sunday Dinner! Do you have your own Sunday Dinner traditions or ones from Home? Do you plan to start new ones? Enjoy with a nice hot brew. Have a safe and Happy Thanksgiving!